It was a story which began with a few paragraphs in a Scottish newspaper and led to the establishment of a youth orchestra in one of the most dangerous parts of the world. And, although eight years have passed since Paul MacAlindin embarked on his remarkable quest to nurture culture across Iraq, the myriad challenges he faced are indelibly imprinted in his memory. The Aberdeen-born musician and conductor admitted that the manner in which he set about founding the National Youth Orchestra of Iraq might have been dismissed as implausible if it had cropped up in a Hollywood film script. Straight away, MacAlindin’s curiosity was piqued. As he told me last week, there might have been more questions than answers, but he was looking for a radical new mission to help weather the recession. “I’m glad it said ‘maestro’, because if it had just said ‘conductor’, I would probably have turned the page and that would have been the end of it,” declared MacAlindin, who has now written “Upbeat”, a fascinating account of how art can thrive in adversity if people are prepared to blaze trails. “But continuing to read, I understood that something potentially big might be happening. Zuhal Sultan, a 17-year-old pianist in Baghdad, was looking for somebody to help set up a youth orchestra in her homeland. And she was clearly very committed and determined to make it happen. “At the outset, I had little knowledge of the task I was undertaking. Let’s get this into perspective. This was a country barely out of a terrible war, with no discernible orchestral tradition, so what could there be to work with? Who was playing music? What did it sound like? Who was teaching? What condition were the instruments in? “And how could I and every other Westerner have been media bombarded with bloodshed and tragedy, but still be unknowing of who Iraqis really are? Fixated on the article, fish trembling on the end of my fork, I simply told myself inwardly: ‘I know how to do this”. The spark had been ignited, but there was plenty of red tape and other travails for MacAlindin as he flung himself into the venture. He contacted Paul Parkinson at the British Council in London, subsequently arranged a meeting, via Skype, with Zuhal, who immediately impressed him – “Sometimes I had the feeling she was the 40-year-old and I was the teenage girl” – and spoke to his close friend, Sir Peter Maxwell Davies, at the time the Master of the Queen’s Music. Bit by bit, the pieces came together, not least through the commitment displayed by Davies, who died earlier this year. 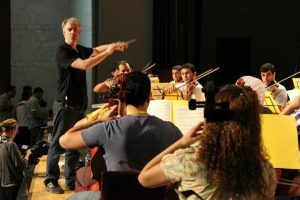 As MacAlindin, who had previously worked with the New Zealand Symphony Orchestra, the Armenian Philharmonic and the Düsseldorf Symphoniker, recalled: “During my phone call with Max in his Orkney home, I managed to declare myself the ‘Musical Director of the National Youth Orchestra of Iraq’, barely able to speak the words. “He replied: ‘All my love goes out to you’, then he blurted out: ‘And I will be your Honorary Composer-in-Residence’. Max had marched in London, along with so many other British people, against the Blair government’s war in Iraq. The next few months passed in a giddy whirl for him and his callow protégés on the other side of the world. In 2009, despite all manner of logistical complexities and financial hiccups, with auditions carried out via YouTube, they ran their first summer school and the orchestra was born. MacAlindin visited Iraq regularly and was both impressed and infuriated by the contrast between the idealism of the musicians and cynicism and profiteering of so many officials. As he recalled: “While players learnt about Schubert, Beethoven, Mendelssohn and Haydn through the tutor team, we learnt from them about the nostalgic Bedouin heart of the Arabs, the sense of tragedy underlining all Kurdish music, and insane levels of motivation. We also grew enormously as teachers, creating solutions on the hoof for our myriad technical, musical and communication issues. Yet, oblivious to these problems, this tenacious group of young instrumentalists came through the most difficult and dangerous of times to produce fine music, not only in Iraq, but also Britain, Germany and France. MacAlindin pulled together a diverse ensemble of both Arabs and Kurds – not natural colleagues – who were largely self-taught and had suffered immensely from the impact of tyranny and war. They were also risking their lives because the so-called Islamic State regarded the creation of the NYOI as anathema. Hence the need for courage and persistence from everybody involved in the groundbreaking venture. He told me: “It was hard to spread the word at the start. All the media coverage about Iraq focused on war and conflict and it was difficult to get the message across that positive things were happening. “I haven’t tried to sugar-coat the orchestra’s story. It triggered a lot of anger among some Iraqis, who felt we were involved in a propaganda exercise. I explained to them, factually, without embellishment, that art could have a positive influence and we were working to take young people out of a dangerous environment, but not everybody believed us. I can say categorically we had no political agenda at any stage, but you can only do your best. “There were plenty of successes and it was incredibly uplifting to watch these musicians come together and do so with a sense of joy. But there were constant reminders of how terrorism was spinning out of control. “Koki, a young musician in Baghdad, was killed by a car bomb outside his home. His innocent face appeared again and again in tributes from our players. Du’aa Al Azzawi missed her exams, terrified of leaving her front door. Hussam, our principal cellist, posted a picture on Facebook of a ten-year-old boy he was teaching with a cello that was too big for him. “It was hard being in the midst of all this, seeing musicians trying to hang on to their humanity, amid increasing despair and hopelessness, as they watched a tide of violence and corruption drain their futures away. “And yet, the love, commitment and respect they showed me in Iraq became core values for us all to live up to when we performed at the Edinburgh Festival or Beethovenfest. Noted cellist, Julian Lloyd Webber, was among those who saluted MacAlindin’s ebullience and enthusiasm and joined the ensemble on stage in Edinburgh in 2012, while declaring that the NYOI’s success around the world was proof of how music possessed the power to create harmony out of chaos. But, behind the scenes, there was an incessant struggle to surmount the obstacles generated by the rising tide of ISIS atrocities and corruption inside Iraq itself. A proposed tour of America in 2014 was eventually stymied by repeated objections from the United States Citizenship and Immigration Services. As MacAlindin explained: “The crux of their paranoia lay in the fact our orchestra’s membership was not constant and we performed only once a year. So, in their minds, a potential terrorist could have been added to the list [of band members] by pretending to be a violinist. It was a frustrating stalemate, but there were many other reasons for optimism. Zuhal Sultan moved to Scotland and studied law and politics at Glasgow University. She and many of her orchestral companions found expression and enlightenment through music. As for MacAlindin, all the political imbroglios and bureaucracy failed to diminish his passion for the enterprise and especially as he watched shy, scared teenagers become confident young adults. “It opened up a whole new world to everyone and they grew stronger for themselves and Iraq,” said the 48-year-old, whose father, Bob, formerly worked as a sub-editor with the Press and Journal. “The impact on the NYOI’s women, in particular, cannot be underestimated. “Everybody played their role as cultural diplomats brilliantly and won over thousands of hearts and minds through the supporting youth orchestras, performances and the international media. “Determined to bring isolation to an end, the players forged international friendships and learnt to communicate not just with one another, but with the music world. MacAlindin has dedicated his book to “the brave young musicians of Iraq”. He, too, has demonstrated resilience and resolve on his gruelling journey. **”Upbeat”, by Paul MacAlindin has been selected as a BBC Radio 4 Book of the Week, is published by Sandstone Press in August. Thanks Peter, it was a pleasure to do it. It’s an inspiring story and Paul has written a truly impressive book. He doesn’t pull his punches, either. As a musician, he faced obstacles from all sides during this project. If you can help spread the word about this, I would be very grateful. There is another ongoing tragedy in Germany today and I know you have had your own problems with terrorism in Australia this week. The likes of Paul MacAlindin need to be supported!